The Xiongnu established two dynasties (centres of power) in their steppe territory. These lasted, however, only for a rather short period of time but were quite important for the later history of China. The first dynasty was the Early Zhou Dynasty and lasted from 304 BC to 34 AD. The second one was the Late Zhou Dynasty which lasted from 52 to 329 AD. Both dynasties were organised as nomads and always had a rather close relation with the then China. Among the tribes united, there was supposedly a tribe called Ashina ("Ashina"  name of then leading clan of the steppe nomads) or Turk (Turkut). They were known among the Chinese as armourers. Later on, the tribe of Turk (Turkut) became a tribal federation, called Xianbei, which  together with the Donghu (Eastern Hu) - controlled the Mongolian-Manchurian frontier territory. They were first mentioned in Chinese chronicles in the 5th century AD. 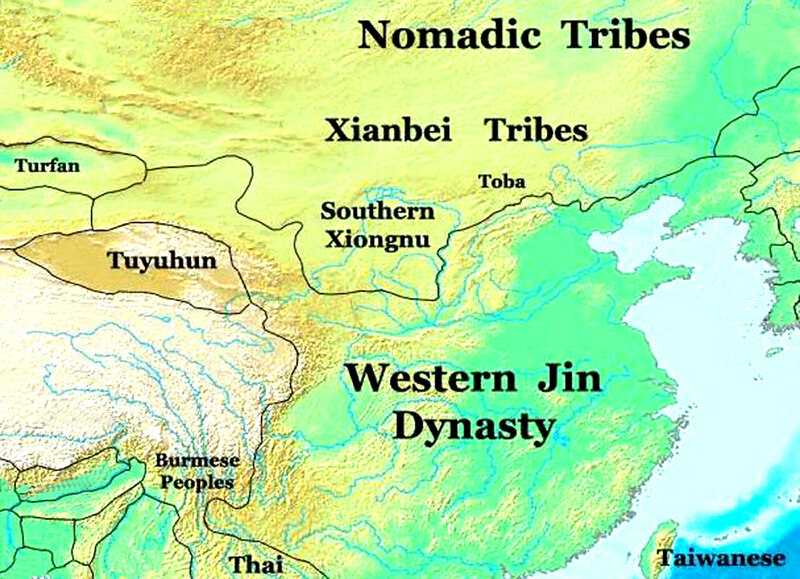 The Xianbei were then subdued by the To'pa dynasty of the Turkic Tabgach (Tuoba  Tang Dynasty) who had also conquered some of the southern Hu tribes. These southern Hu are today considered a Turkic tribe. The To'pa dynasty controlled the areas which were later known as the region Xingjiang. Xiongnu is also a Chinese name for the tribal federation with equestrian nomads controlling large areas of Central Asia between the 3rd century BC and the 4th century AD, mainly through their mounted archery. They founded the first steppe empire in history, as a kind of countermeasure to China's policy of conquest by means of their wagon troops and infantry. They controlled areas of today's Outer Mongolia, of the western Gool Mod region (river in the Mongolian Altai) and the northern Noyon Uul (Noin Ula  due to Kurgan foundings also at the Selenge River). Their main rivals were, apart from the Chinese, nomadic tribes such as the Yüe-tschi (have to be considered as Scythians). They were an Indo-European and Indo-Germanic group settling in the province Gansu of today's China as far as the Tarim Basin. They were considered mercenaries of the Chinese and identical with the Tocharians (These also belong to the Indo-Germanic language family). The Xiongnu were divided into several tribes upon their defeat against the Chinese and neighbouring tribes, and as a result pushed, at least in part, farther west. In Chinese chronicles they were mentioned for the very first time in the year 230 BC, although it may be assumed that the Chinese had known them already much earlier. They did, furthermore, excert influence on Chinese warfare, which was being developed during the Warring States Period. The mobility of these equestrian troops led to the construction of the first big wall (continuous defensive fortification) under Emperor Qin Shi Huangdi (Prince Zhao Zheng), the founder of the Qin Dynasty (221-207 BC). The Turkic and Mongol peoples claim to be descendants of these tribes. In Europe the Huns were seen as their ancestory. But according to latest research findings, the Huns and the Xiongnu are not seen as identical people anymore  maybe based on the fact that the early nomadic tribes were tribal federations, a union of different ethnical and cultural groups, which were organised, separated and re-organised in rudimentary political systems according to the then prevailing situations and conditions. On the basis of latest research results, there may be considered that the Xiongnu and Huns of today stem from today's Mongolia and the neighbouring Altai and Sajan Mountains. It remains, however, unclear whether the tribes which were called Huns by the Europeans really were an "extension" of these tribes. The Chinese denomination Xiongnu was in general only used for Mao-tun's state and refers to the eastern groups which showed more Old Turkic and Mongolian characteristics (form of the eyes, etc.). 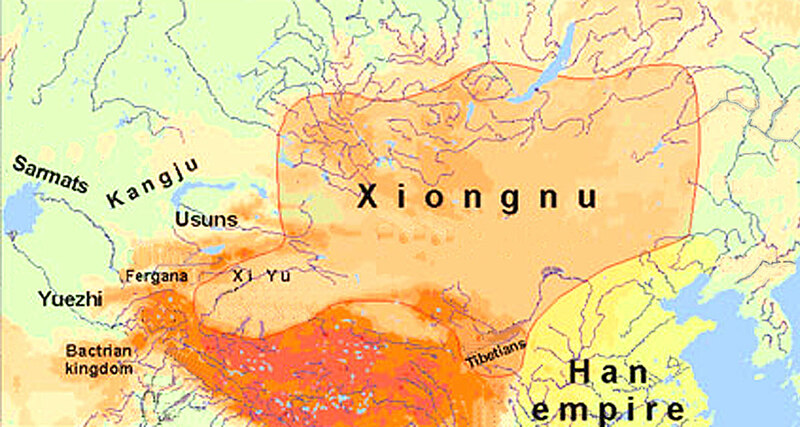 The denomination Huns refers to the groups of the Xiongnu who had been pushed towards the west and which were more assimilated with the Indo-Germanic groups. The name was mainly used in Europe in association with Attila. The Xiongnu are, just as the Huns, a product of assimilation of different Altai and Sajan tribes. They assimilated over several centuries with some Indo-Germanic groups (Saka "Scythians", Sarmatians, Alans), on the one side, and Mongoloid groups from the Taiga as well as cattle breeders expelled from the Chinese frontier areas, on the other one. The Chieh, one of the 19 tribes of the Xiongnu federation, were well-known, for example, for their long noses and full beards (349 BC). In the 8th century BC there was already used horse harness in the Altai area; there were not to be found, however, housing settlements. These "barbars" were known among the Chinese as the following, collective denominations used in a chronological order: Jung, Ti and Hui or Hiu-yun. The Ti, for example, are described, as a warring infantry in two cruzades (714 and 541 AD). The Xiongnu who were, according to latest traditions, a branch of the tribes mentioned above, are to be considered mainly as equestrian nomads. But some of them, however, are described as having settled down: for instance those who had settled down in Transbaikalia (region of the Lake Baikal). Chungvi Khan, who was first mentioned in 1800 BC, is considered the legendary progenitor of the Xiongnu, the Turkic as well as the Huns. In 1766 BC they were first mentioned in scriptures of the Chinese Xia Dynasty telling that Kia  the 17th member of this dynasty  was disempowered. According to records, Kia's son Sunni founded, with about 500 other tribe members, an individual tribe that was later called the Hui. Sunni in this way probably established the important Tuyku clan which later on all rulers of the Xiongnu and Huns claimed to be descendants of. He was also closely related with the Ashina-Chuni Clan, this is the progenitor of all rulers of the Göktürks. In the 3rd century BC, the Xiongnu founded a first empire under Tu-men and his son Mao-tun (209 to 174 BC) and threatened the Han-Chinese. There were introduced elements of a former state. In some areas, there were applied uniform laws and punishments. Furthermore, Mao-tun established a military entourage (Ordu) that might be quickly and readily used, and there was further created a strong central administration with several hierarchic steps; this administrative sytem was finally enlarged under Mao-tun's son Ki-ok (Laosheng, ruled 174-161 BC). The latter also introduced a kind of national duties (taxes). The rulers hence belonged to the Suylyanti Clan, a sub-clan of the Tuyku, and they developed those Old Turkic traditions that were adopted by all subsequent steppe tribes for their "nomadic empires". In the period between 350 and 290 BC, there were created fortifications at the northern frontiers with the Chinese Khanates, thus establishing an antecedent of the Great Wall (15th/16th century AD in the Ming Dynasty). The Zhou King Wu-ling (325298 BC), for example, had his troops trained in the art of riding and archery and he also took over his enemies' clothes. In the 26th year of his rule, he wiped out the forest Xiongnu (settled nomads). The first historic document found dates back to 318 BC: This is a border treaty signed by the Chinese and the Xiongnu. The great Chinese historian, Sima Qian ( 85 BC) was the most important one describing the Xiongnu in greater detail. Under Ki-ok's rule, the Xiongnu threatened China's capital Chan in 166 BC. About 160 BC they attacked their arch-enemies, the Yüe-tschi, and totally and utterly defeated them. In the course of this cruzade, Ki-ok was killed. Expelling the Yüe-tschi from the province Gansu of today's China, resulted in a big migration movement. The Yüe-tschi settled in Bactria, where also the Saka (part of the Scythians) drawn along decided to settle down. Their exodus resulted in the destruction of the last Greek empire in Bactria (that of Heliocles) and the subsequent conquest of parts of north India by the Saka. From this point on, the Xiongnu were the absolute power in Mongolia and probably in the entire area of Eastern Turkestan. This was the reason why the entire area was much more acknowledged by the Chinese. Turkestan  Land of the Turks  is a dry mountain region in Central Asia and extends from the Caspian Sea in the west towards the Desert Gobi in the east: Originally it was settled by Iranian tribes and known among them as Turan ("Turan Plain" or "Turan Depression"). Between the 13th and the 16th century the region was controlled by the Mongolians and known in Europe as "Great Tartary". Today "Turkestan" is frequently substituted for the denomination "home of the Turks" (hence with the home country of the "Turkic people"). In a historic way, these substitution, however, is wrong as the proper original "home" of the Turkic people was situated farther east, namely in today's Mongolia. Today in the region Turkestan there are living different ethnies, with the Turk speaking people forming a majority: Turkmen people, Uyghurs, Usbeks, Karakalpaks, Kazakhs, Kyrgyz, Tatars, Azerbaijanis, Karaim, Crimean Turks, Meskethian Turks and Turkish people, apart from the old-established Iranian people such as the Tajik people, the Persians, and the Afghans. Upon repeated skirmishes, Han China under Emperor Wu-ti defeated the Xiongnu and pushed them back to their proper home area: in 119 BC they were defeated by Mao-tun's grandson Yizhixie (126114 BC) at the later Urga (Örgöö, today: Ulaanbaatar) in Mongolia, as the Chanyu (leader, prince) did not believe that the Chinese under general Huo Qubing were able to cross the Gobi without any harms. But Chinese horse breeding in this way unfortunately found its end, so that the Xiongnu were only left with the control of the steppe (in 105 BC they recorded the next success). In these skirmishes the control of the Silk Road become an important economic factor for the Xiongnu so that the Chinese also wanted to get their share, especially under general Pan Chao of the Eastern Han Dynasty. About 60 BC the rule of the Xiongnu came to an end and was divided into 5 hordes  this was the result of a number of fraternal strives which were also supported by the Chinese. Under Hu-han-ye (5831 BC) there was even realised a temporary settlement. He went to the court of the Han Emperor, submitted to Chinese control and hence was able to crow about his rivals. He consolidated, with the help of the Chinese, his power in Mongolia (51 BC). One single horde under the leader Chih-chih (Chih-Chih Huns, however, remained independent and they moved towards the west. They settled down in the neighbourhood of the Alans at the Chu River (or Chuiy River in northern Kyrgyzstan and southern Kazakhstan) where Chih-chih was suddenly attacked and killed by the Chinese in 35 BC. The (Eastern) Xiongnu Empire was re-established under Hu-han-yeh's son Hudur-shi-dagao, who supported the late Han against Wang Mang. After this rather short revival the empire collapsed into two parts. Hudur's son Punu was not acknowledged by all tribes of the Xiongnu as Chanyu (leader). There were eight tribes that revolted under their leader Khukhenye (also known as Pi) against Pu-nu (he reigned) and submitted to the power of the Chinese Emperor. They were moved to the Ordos region (Inner Mongolia). In the war between the two cousins the Xiongnu who had not moved towards the west were divided into a northern and a southern part. The southern part conquered Luoyang (town in the province of Henan) and there founded a dynasty, the Early Zhou Dynasty. There were also established some smaller dynasties (principalities). At this time, their biggest enemies were not the Chinese but rather the Xianbei (a horde originating in the Mongolian-Manchurian frontier area) as well as another nothern power, the ethnical composition of which remains unknown. The Han set the neighbouring tribes (Southern Xiongnu, Sien-pi, Xianbei, Wuhuan, Wusun and Dingling) on the Northern Xiongnu and won. The Han Chinese general Ban Chao (Han Dynasty) conquered Central Asia in the reign of the Emperor Ming of Han (Liu Yang). The Chinese co-operated more and more with the Xianbei. Sien-pi: The Imperial Family of the Earlier Yan was originally a chief family of the Sien-pi people at the time of the Western Jin Dynasty. Wuhuan: They were a nomadic people settling in northern China (today's provinces of Hebei, Liaoning, Shanxi, district Beijing and Autonomous Region Inner Mongolia). Wusun: These were shepherd nomads without towns and agriculture. They lived in the area southeast of Lake Balkash alongside the Ili river. As legend has it, Liejiaomi founded a Kingdom of the Wusun. Dingling: Initially they lived at the upper course of the river Lea, in the west of Lake Baikal. In the third century before Christ, they started their expansion towards the west. They were a part of the Xiongnu Empire (Hsiung-Nu). In the year 87 AD the Xianbei killed Chanyu Yu-liu. In the years 89 and 91 AD two Chinese generals made great victories near the Chi-la Mountains (Kashgar  Tashkurgan  Xingjiang) and the Altai. They expelled the beaten Chanyu to the Ili and appointed his brother Youzhujian as leader. He was, however, already in 03 AD defeated and killed by the Xianbei. This was the beginning of the Xianbei predominance in the steppe. The power of the Xiongnu in Mongolia came to an end about 155 AD. The power of the Xianbei initiated a kind of power vacuum in Mongolia which was to last for about 250 years. When Tan-shi-huai (about 156181 AD) led the Xianbei to the climax of their power, the Northern Xiongnu, at least according to Chinese chronicles, gave up Eastern Turkestan about 158 AD and settled down in the north of Kangiu (this is, in the northeast of the Aral Sea). From 166 AD on, Tan-shi-huai moved up and reached the Ili. 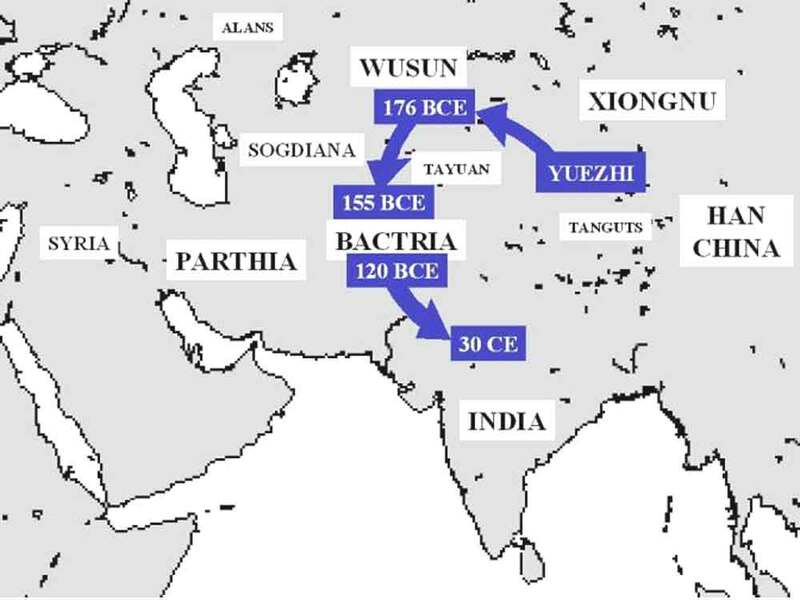 One assumption made by historians, namely that the groups of the Xiongnu which moved towards the west were the ancestors of the European and Asian Huns, Attila's Huns, Xionites, Hephthalites, cannot be proved by research findings; Attila's Huns were probably a fusion of different peoples and tribes. The Southern Xiongnu, up to then held sort of prisoner at the Great Wall (precisely in Shanxi), pushed farther south under the leadership of Hu-chu-ch'üan (195216 AD), as allies of the collapsing Han Dynasty. In 260 AD another tribal federation, the mainly Turkish Tabgach (Tuoba), came to power in the north of Shanxi. Under the leadership of Liu Cong, the Chinese Attila (died in 318 AD), the Southern Xiongnu re-conquered the capitals of Jin China, but they were, however, already defeated in 352 AD by the Mujung Xianbei following under their Khagan Tsun. Over the time, the Xiongnu had extremely changed. On their long trails they had mixed with  mainly Indo-Germanic  tribes and now started to adopt their culture. They also began to construct permanent towns and establish intensive trade relations. The Xiongnu founded, among others, the towns of Ordu Balyk and farther north, Kara Balagasum, the old Kuz Ordu; but also towns along the Silk Road, such as Kara Hotscho, Kashgar and Jarkand, were founded by them. Excavations in Gool Mod, the former army and main quarter of the Hunnic Xiongnu, have shown that these already had a rather sophisticated culture and were not the "people without a culture" as they had been described and displayed by the Chinese. There were found fine goldworks and Chinese snake ornaments substituting the dragon and animal symbols of the steppe tribes and in this way showcasing the relations with China. Archaeological findings indicate a culture that could be found in a vast area extending from Transbaikalia (region Lake Baikal) as far as Inner Mongolia from about 200 BC on; this culture followed the plate grave culture of the Bronze and Early Iron Ages. The population had, according to bone finds, Caucasian as well as Mongoloid elements. Important excavation sites are the settlements of Iwolginskoje Gorodischtsche at the Selenge River and Noin Ula in Mongolia. The objects found there show relations with China as well as the upper course of the Yenisey and, finally, the Tashyk culture. The ceramics were already produced on the potter's wheel and had a rather uniform design throughout the entire area. There were found high, lean vessels with narrow neck, conical cups and deep bowls with vertical upper part and extended, rather broad rim. The ceramics had a pattern of polished stripes, scratched bands and diverse stripe patterns as ornaments. They also had rather state of-the-art arms, to be mentioned, in this connection especially the composite bow and the scale armour made from iron. Apart from arms, there were also produced various objects of utility, tools, horse harness and costume decorations made from iron, the latter including also belt-buckles, belt plates with figurative decorations and strap ends. They were not mainly nomads. Especially in Baikalia, there are known quite a number of proto-urban settlements, frequently fortified by means of walls. Within these walls, there were to be found pit-houses (Polusemljanki) and post constructions even with the ground. They lived on livestock breeding, especially of dog, sheep, goat, cattle and pig, as well as agriculture. The latest findings that could be allocated to the Xiongnu date back to about 100 AD. In the northern region there could not be realised any archaeological findings going back to the 5th century AD, whereas in Inner as well as Outer Mongolia there were found objects pointing back to the Xianbei, in this way displaying openly the relation with the culture of the Xiongnu.